We must destroy — in order to create our green driveway. That reality hit me as the big yellow bobcat arrived at our house and started digging up and disposing of the compacted soil, gravel, limestone and sand that had been sitting undisturbed for 20 years. If we are building a green driveway, it’s a realistic expectation that we must be green, right? Well, we’re going to try our best but it’s not easy. ‘Reduce, reuse, recycle’ keeps ringing in my head. We scored ‘reuse’ for the 800 square feet of interlock by giving it away. Now, you may be thinking, ‘Why did she give it away? Is she nuts? She could have sold it!’ And you may be right. But I dunno… selling 20-year old interlock didn’t sound easy. In fact even giving it away was pretty tricky. I called up Habitat for Humanity but they didn’t want it. Storage issues. I tried to give it to a local landscaper. He seemed happy enough to take it. But the reality was he never showed up. I thought, “This is crazy. Does nobody want our interlock?” Then a friend told me about Freecycle.org. I could have given away 10 driveways. Freecyclers sent me their stories as to why they were the most deserving. In the end, a lady who lives one block away came and with the help of a brother-in-law and a university student, picked up every darn block for use in her back patio. She was so grateful she returned the next day and gave me three plants to start our green garden. But I was just delighted that we’d kept it out of the landfill, and we didn’t have to pay anyone to remove it! So getting rid of the interlock was relatively easy… But now the big hulking machines had arrived. The challenge — to transform what has been a multi-car driveway for 20 years into a beautiful, lush garden and single-car green driveway. 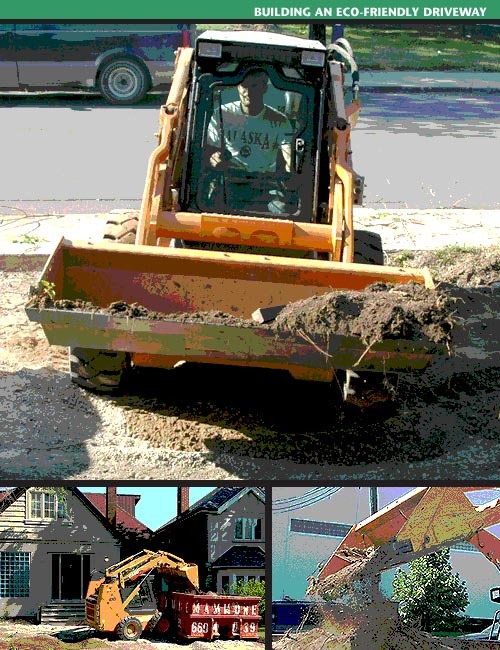 We tried hand-digging… Two able-bodied guys removed 4 cubic yards of limestone screenings and soil in one day (a cubic yard is approximately the size of a kitchen stove.) Four stoves, not bad. In contrast, the DOC bobcat arrived and removed 16 yards in less than one day. But where does it go? In our case it got hauled off as ‘clean fill’ to be processed, sorted (any stray rocks need to be removed), graded and resold. 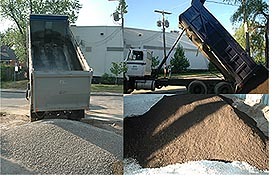 “In the soil blending industry the term triple mix has been loosely used to describe or imply a soil which is enhanced or enriched in some way to provide and sustain better, healthier, and more vigorous plant growth. There are many variations of triple mix available that range in composition, texture, specific density (weight), workability, fertility, functional performance and color. Primarily it is an organic soil, which means it has more than 15% organic content (high biological living matter made up of decomposed vegetation, moisture, air and friendly microbial activity); that provides good soil structure and stability, plant nutrients, moisture and air for new plants to grow & thrive. I would like to know how the green driveway is performing now, after a couple of years of use. I’m considering this option, but want to know what to expect long term. Thank you for any help, and I hope you are enjoying your greenspace. We’re about to start a green driveway project on a net zero house – not finding tons of info out there. Same question as person above: how is the performance of your driveway? Also, how has it done during the winters? We are in Boulder CO. We have read that we could shovel it or have it plowed. Have you found this to be true? Thanks for any/all pointers. Many many thanks for putting together this blog. As we don’t have a car, we have the luxury of not needing to plow it. We have shoveled it without problems. I’ll be doing a new post about the grass itself. The drought tolerant grass did not do well as it had deep roots which were not well fed in the gravel/loam/sand substructure of the driveway — it required more water than conventional grass. We have replanted with clover, and so far it looks good.